My name is Alistair Park and I'm a professional carver who is based in Bristol, England. 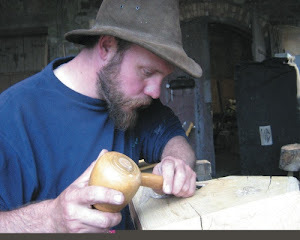 I've been carving for over twenty-two years and I also enjoy teaching my skills to people of all ages. 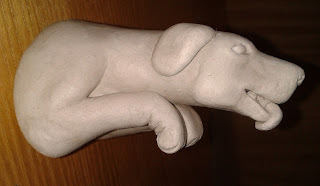 You'll find posts here about all kinds of things to do with carving; the work that I do, the people that I meet and the things that I see which inspire me. Please feel free to comment on anything of interest, it'd be great to hear from you! As well as this blog, I also have a website with lots more images of my work as well as a few more stories. 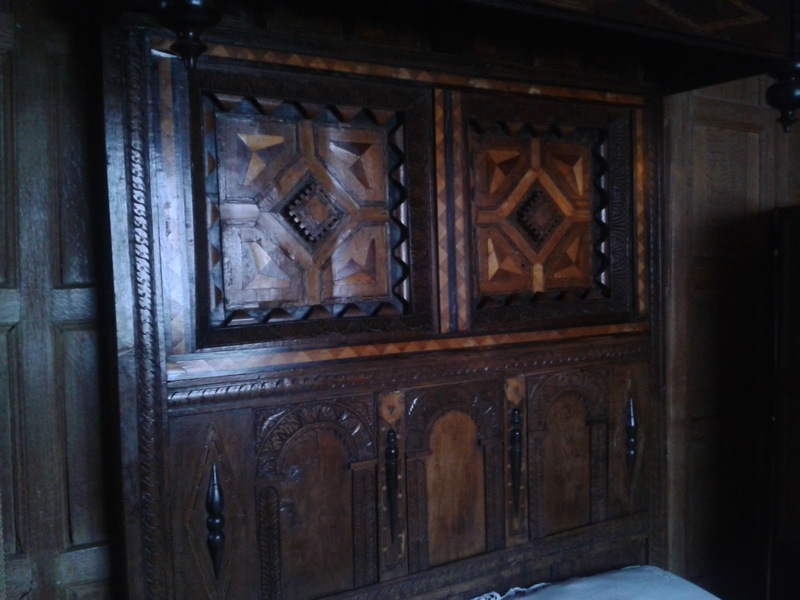 If you like woodcarvings, you'll want to have a look. I will be doing some carving in Bath limestone at this festival of stonecarving, which is to be held on the harbourside in Bristol. 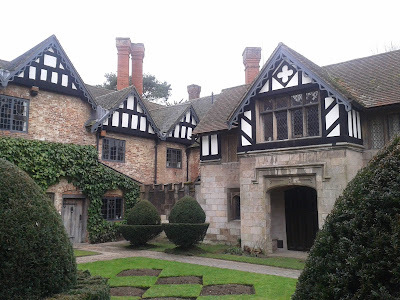 Baddesley Clinton manor probably dates back to the 13th century, when the Forest of Arden was being cleared for farmland. 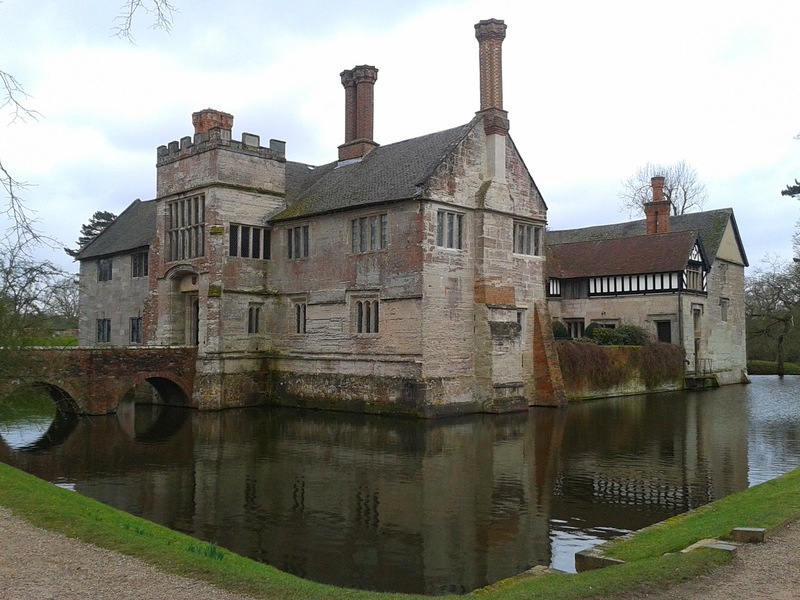 In 1438, John Brome, who was the English Under-Treasurer, acquired the house and it later passed to his son Nicholas. Nicholas built the entrance way that you can see above, complete with gunports around the doorway for defence. 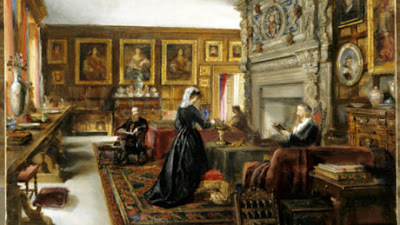 Nicholas' daughter married the High Sheriff of Warwickshire, Edward Ferrers, in 1500. 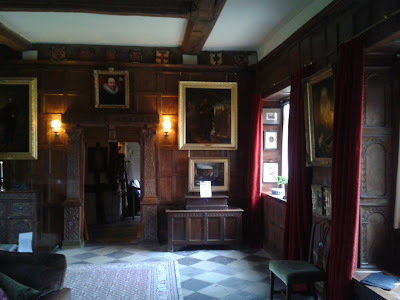 When Nicholas died, the house went into the Ferrers family and remained with them until 1940, when it went to a relative. 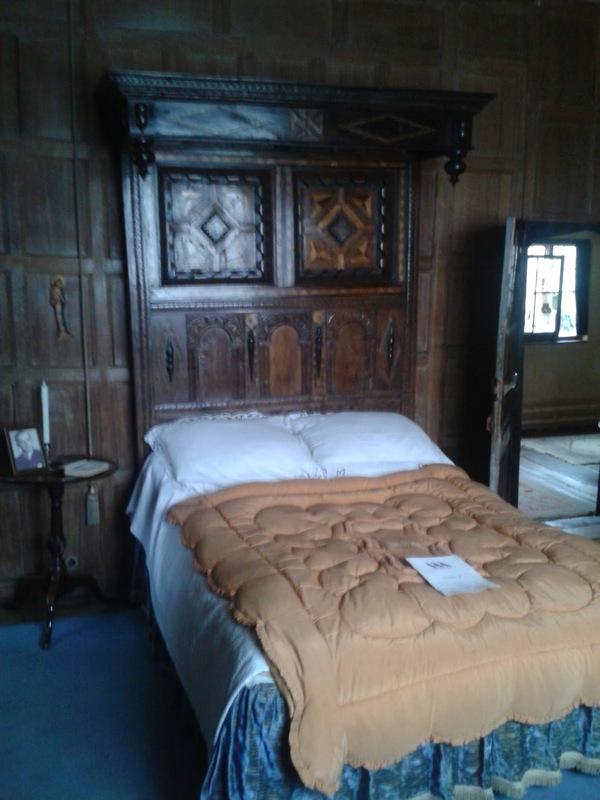 His son sold Baddesley Clinton to the National Trust in 1980 and they now look after it. As you might expect from a house that has been occupied for so long many features, even whole parts of the building, have been moved about and altered over time right up until the 1940's. The impressive 16th century fireplace in the main hall was even moved at some point from the upstairs parlour - quite a feat! 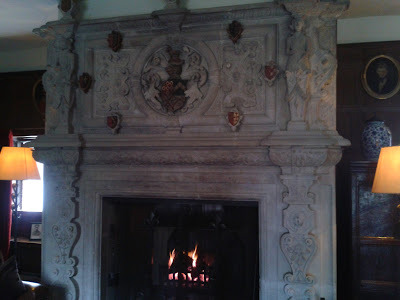 Henry Ferrers lived there from 1549 until 1633 and a lot of decorative carvings and building layout still exist from this time (including the fireplace shown above). The second group of residents to leave a particular mark were 'The Quartet' in the 19th century. They were Rebecca Orpen and her husband Marmion Edward Ferrers, who lived at Baddesley Clinton with her aunt Lady Chatterton and her husband, Edward Dering. They were completely absorbed in art, history and their Roman Catholic faith. Long before the Quartet's occupation, the house was a refuge for Roman Catholic Jesuit priests during the reign of Elizabeth the First. Despite being raided in 1591, no priests were ever found there. Lucky for the Ferrers, as they would all have been executed for treason if they had been caught! 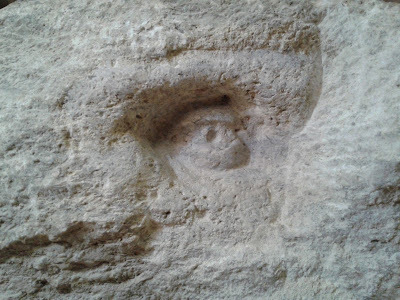 There are at least three 'priest holes', designed by Nicholas Owen, still to be seen in the house. 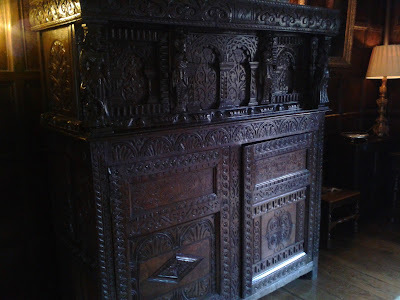 They were carefully-hidden hideaways for priests in the event of a raid. 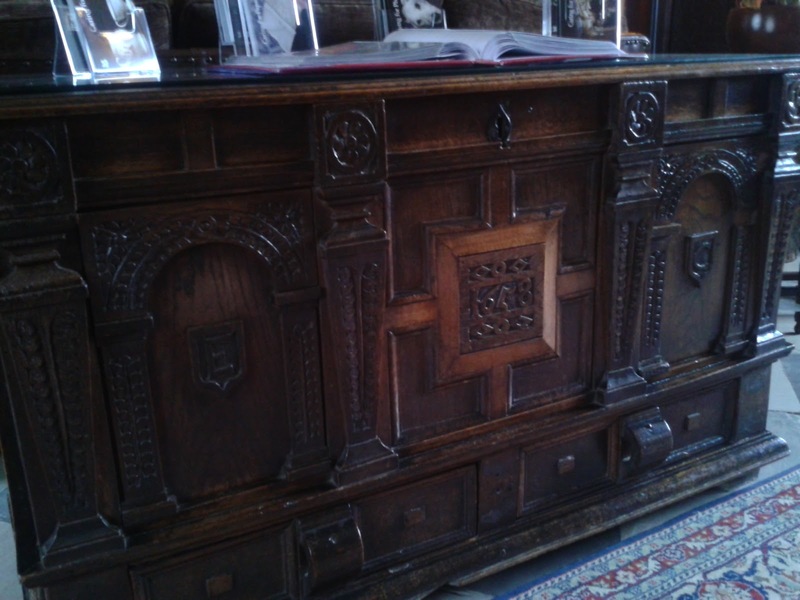 It's interesting seeing how the styles of the furniture and carved decoration changes over the years and how individual pieces would be adapted by later owners to suit their needs or the latest fashion. carving technique give it its own charm. In the 17th century, most carving tools were made by the carvers themselves or by a blacksmith, whereas in the 19th century specialist companies offered diverse and sophisticated carving tool ranges. Many specialised carving tools made in the 19th century can still be found in carving tool sets in use today. 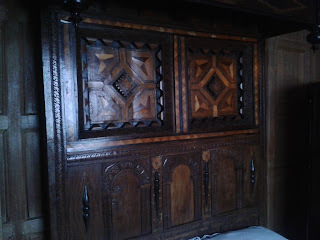 In the adjacent bedroom is a bed which is reputed to have been made from pieces of wrecked Spanish Armada ships. 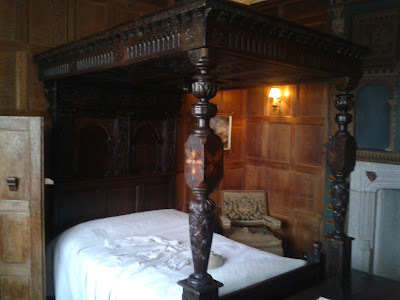 It is known as, funnily enough, the 'Armada Bed'. 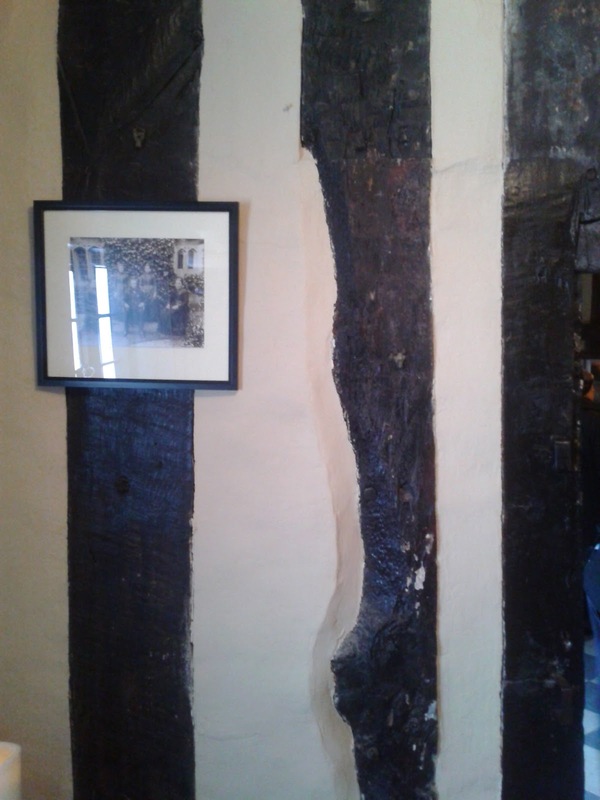 Near the 19th century extension for the servant's quarters, I noticed this waney-edged oak beam in a wall which was presumably built during 16th century if not before. I like the way that the builders didn't bother hewing it square all round - "that'll do, stick it in there!" 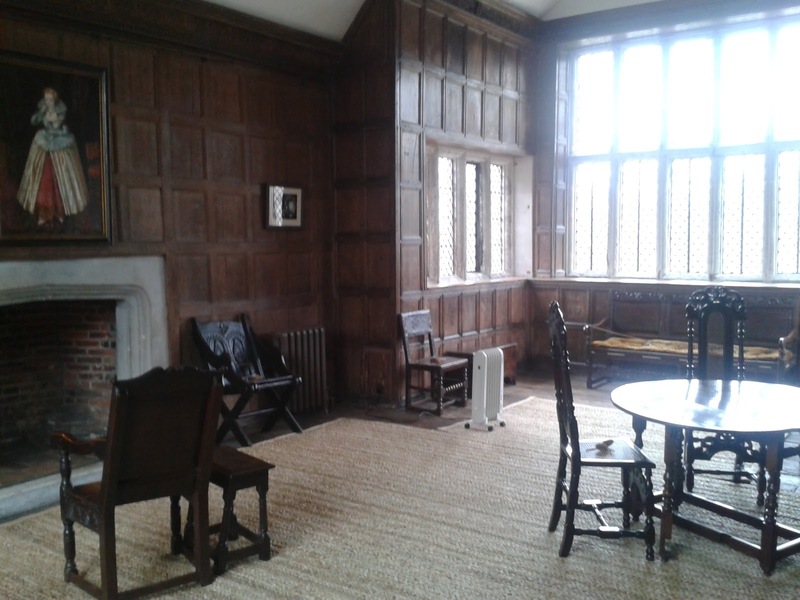 The constant remodelling of the house over the centuries throws up a lot of interesting questions about how it all came to its current layout. The little room shown below is a very good example. There are three small, asymmetrical windows at the far end. It is known to have had a partition wall running along the centre of it from the windows, which was removed relatively recently. A trapdoor below the windows leads into the room below. The ceiling is continued in the larger room to its right, converted in the 19th century into a chapel, from which it is separated by an oak panelled partition wall. The wall shown on the left of the photo has sturdy oak beams and looks to be an old exterior wall, but the door leads through into bedrooms that Henry Ferrers had built in the 16th century when he remodelled much of the first floor. 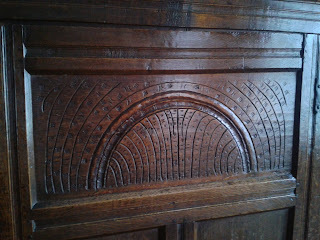 The doorway in the wall has been cut into one of the biggest oak beams in the wall, so weakening it. 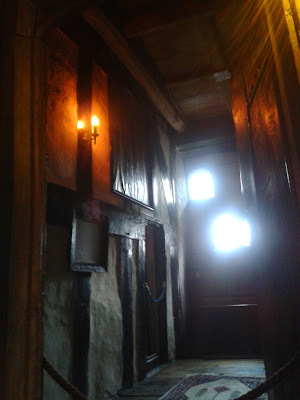 The little room may have been a sacristy (priest's robing room) for the chapel in the 19th century, but why and when was the doorway cut into the beam? Why are the windows laid out in the strange way that they are? Why was the removed partition wall originally put in, to make two very narrow rooms? 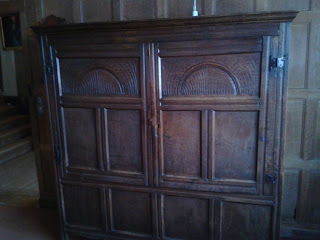 What was the trapdoor for? With the often-undocumented changes that the house has gone through over the centuries, I doubt that we will ever know the answers to all of the questions about Baddesley Clinton. I've been working on the roundhouse today and got the last piece of waterproofing plastic on. Before the next stage, I just need to stick it down, fix the skylights on again properly and put on the plastic strips to protect the seams (see Simon fitting it on a seam below-I'm using sikaflex and strips of the old damp proof membrane, as the jointing tape I bought is useless). I admit that this post is really just an excuse to show the photo of the roundhouse with a rainbow. Last week I was invited to a couple of openings to do with art events that I've been involved in. 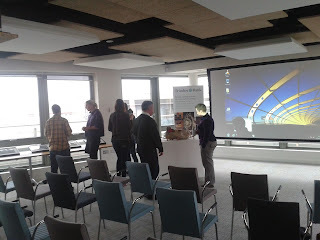 Then on Friday, it was the busy private view for the 'Cornucopia' exhibition at the Grant Bradley gallery in Bristol. 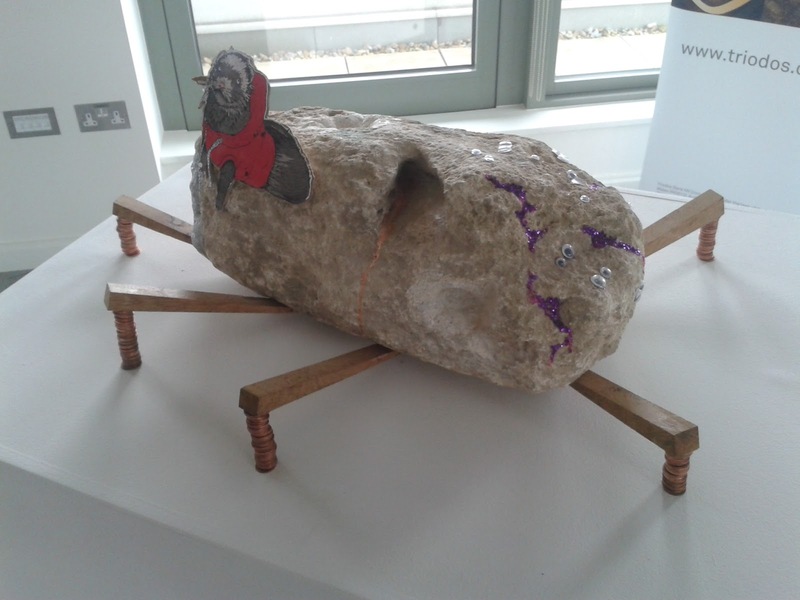 I was really impressed by a lot of the other work on show- most of it was of a very high standard. There are thirty people exhibiting and all go to one or other of the life drawing groups organised by Will Stevens in Bristol. 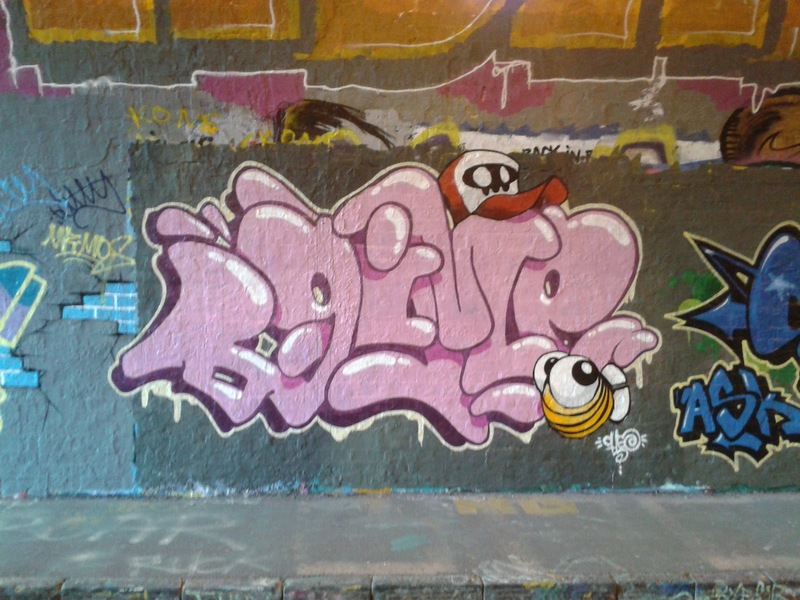 Quite a few are professional artists or are closely involved in the art world in Bristol in some way. 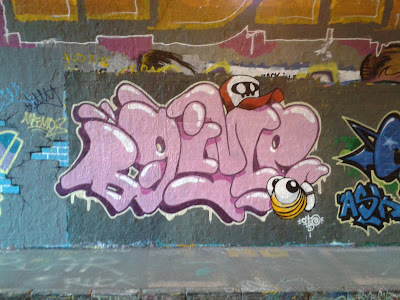 I really like the one above, it's been up for a while and has collected a couple of crappy tags, but it's a great piece. 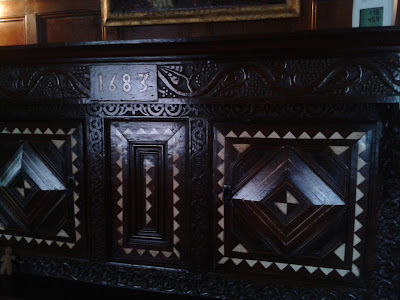 I dropped into the library yesterday to do some more research on the figurehead for the 'Matthew' and took the opportunity to get a couple of photos of the Gibbons overmantle in the Bristol Room. It seems incredibly hard to find any recent images of the overmantle online, so here's some. They're a bit dark, as the room is shaded to stop light damage and I didn't want to use flash photography for the same reason. Even so, there's not that many other pictures of them about it seems, so I hope you like these ones! The Boiling Wells roundhouse roof. Ecobuilding vs the elements! 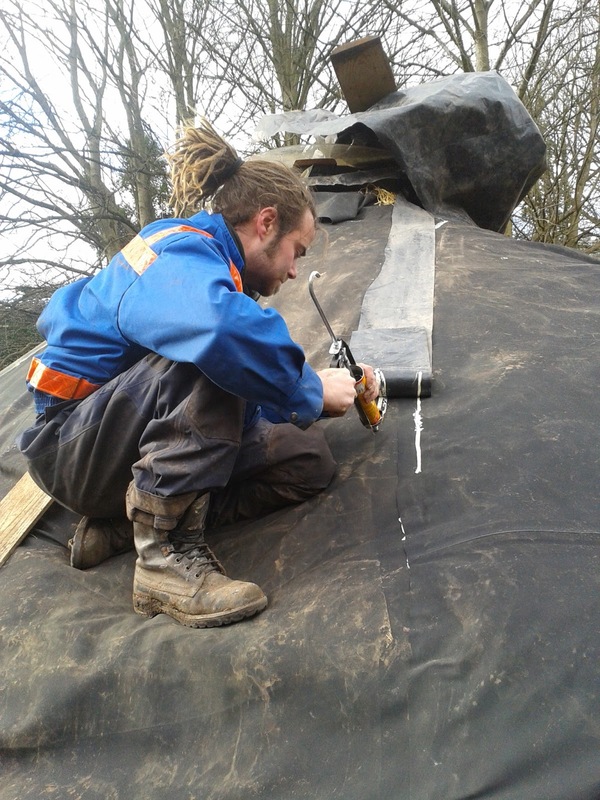 Work has been slowed up a bit on the roundhouse roof recently thanks to some pretty unhelpful weather. First heavy snow, then heavy rain and then strong winds- it seems like every week there's a severe weather warning! It makes it pretty tricky putting on the cut sheets of pondliner and the underlying straw without it getting soaked or blowing away. However, the pondliner has now been fitted to two-thirds of the roof, which will be the waterproofing layer. When this is finished, it will be covered with geotex and then some plastic netting, to give some footing for the gravel, soil planted with low-growing herbs and sedum which will go over it. The 'Greenseal' EDPM pondliner has been a bit trickier to work with than expected, no tape seems to want to stick to it and so I'm gluing the sections of it together with Sikaflex and will cut the old DPM polythene waterproof layer into strips and then stick that down over the joins. Still, things are moving forward slowly-watch this space! White Greyhound of Richmond vs Talbot- which dog will the new carved Matthew figurehead be? This post seems very appropriate, when king Richard the Third's bones have just been discovered. 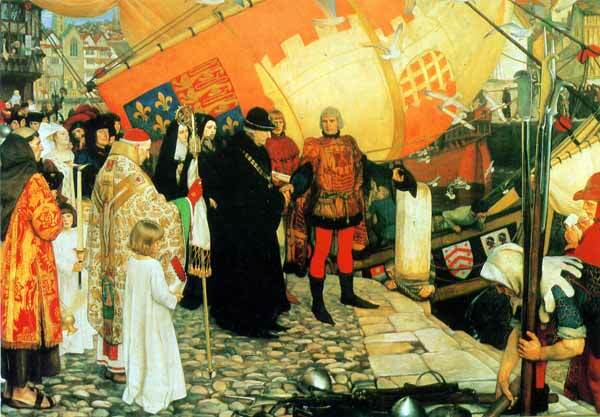 His conqueror and successor, Henry the Seventh, granted John Cabot (or Giovanni Caboto to give him his real name) permission to sail in search of 'all parts of the eastern, western and northern sea' to look for new lands. Cabot sailed from Bristol in 1497 and eventually landed in what is now either Newfoundland or Nova Scotia, so becoming the first European ship's captain to set foot on what became the North American mainland since the Vikings (or possibly St Brendan). I've been having a very interesting discussion with Royston Griffey, the chairman of the trustees for the 'Matthew' about what the subject of the new figurehead for the Matthew should be. 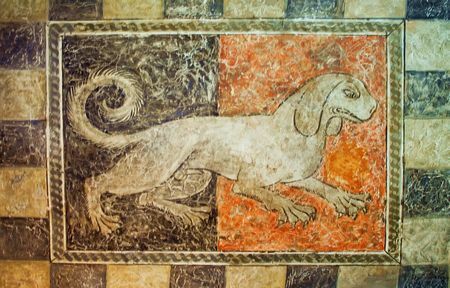 Royston particularly likes the White Greyhound of Richmond, the badge of Henry VII. My research has led me to believe that a Talbot is a better choice. Talbots were a now-extinct breed of hunting dog which were very popular in medieval times. 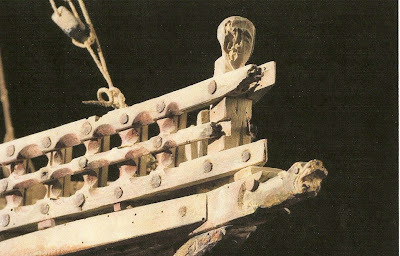 The original figurehead on the replica 'Matthew' was a Talbot head carved by Paul Hatch but this was lost a few years ago in a collision at sea. The picture below is of a Talbot and comes from Haddon Hall in Derbyshire. Lawson Cypress, one of the trees cut down during the landscaping work at Ashton Court. The felling was quite controversial and so a lot of Bristolian people know about this tree. It's nice to be able to use it for a good cause. The timber is durable outdoors, not too heavy and resistant to woodworm attack. The blocks will be fixed together to make the final complete block for carving, but will be roughly carved separately first to make them easier to handle. One block has already had the profile of the Matthew's bow cut into it, so that it will fit snugly. Each block is a metre long. Greenheart from the old North Junction lock gates, which were recently replaced. A friend called Jim Sharples gave me it when he built the bench currently outside Mshed from the gates. 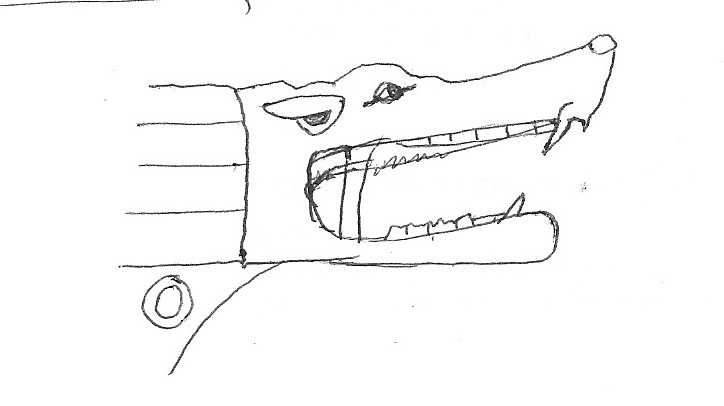 I would fix this hard, dark wood into the figurehead as the nose and eyes of the dog. An offcut piece of mast from the SS Great Britain, when the masts were replaced in the 1970s refit. The timber is, I believe, Douglas fir. The rest of the chunk is now a bench at St Werburghs City Farm, where I work part-time. I will cut sections of this and fit them into the block to be carved as a link to the Great Britain, another important part of Bristol's maritime heritage. When carefully researching the subject over several days to come up with ideas for the figurehead design, I too was at first tempted to carve the White Greyhound of Richmond- it is a very attractive subject for a carver after all. However, I quickly realised that this would be the wrong choice for several reasons. The 'Matthew' was almost certainly not a ship of the line, and so would not have carried a royal figurehead normally. 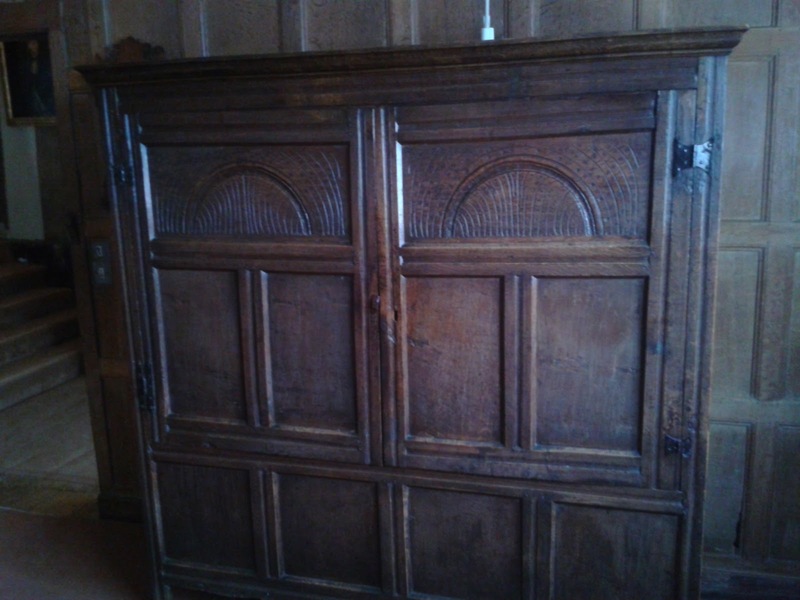 As you pointed out Royston, it was probably bought or hired. It seems highly unlikely that such an elaborate (and expensive) figurehead would be made and bolted onto a ship that was going on such a potentially perilous voyage with a good chance of not returning. It's also unlikely that an expensive ship of the line would be sent on such a mission (which would also perhaps draw unwelcome attention from the Spanish and Portuguese). 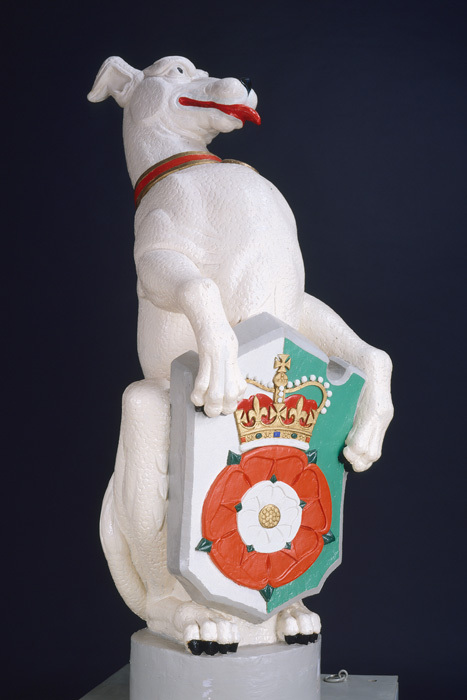 The actual design of the White Greyhound of Richmond is far more elaborate than was usual for ships figureheads of the time. No pictures from that period show anything nearly as complex as this. In Carr Laughton's Old Ship figureheads and sterns he says 'such applied ornament as there was before the 16th century was almost certainly extremely simple'. 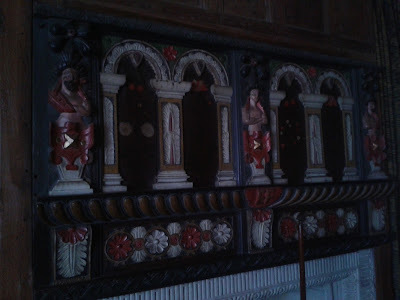 He does point out that there are 'about 1400 very occasional mentions of 'personages', which personages appear usually to have been saints, and of the royal leopards or badges similarly carved' but then goes on to point out that it was far more usual for such badges to be painted on the ship rather than carved as a figurehead. The National Maritime Museum confirms this on their website. I've shown some other examples from my research below. The top one is the figurehead on the 'coca de Mataro', a model of a carvel-built ship (probably a votive offering) from the 15th century, now in a museum in Rotterdam. 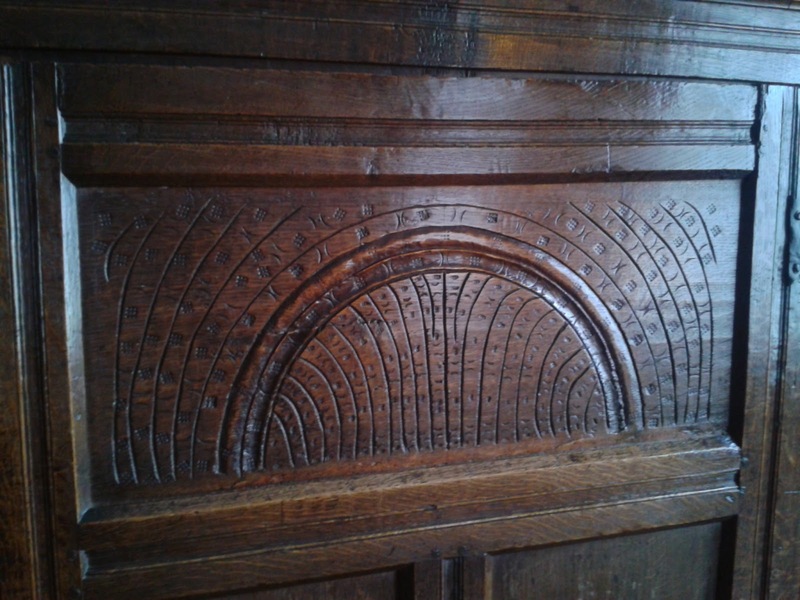 It's believed to have been made by a shipwright and to be an accurate representation. No figureheads seem to sit below the bow, but obviously that is where one would have to sit on the replica Matthew. I have spoken to my friends who have crewed many times on the 'Matthew' (Louise, Breamie, Darren, Tom). From talking with them, it became clear that the figurehead takes quite a buffeting in high seas. The White Greyhound is a complex and graceful design, but this is why it would be highly likely to get damaged at sea, particularly the muzzle and legs. 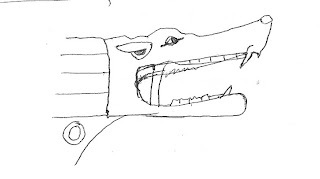 One way to strengthen the figurehead might be to drop it's head down onto the neck, but then a dog which looks like it has a broken neck is probably not ideal either. The figurehead needs to have a sturdier design. One important reason for me offering my services was to make the figurehead initially was as a tribute to Breamie (Steven Kelly), who crewed on the Matthew many times and even helped to save it once, when the whipstaff broke in a heavy sea. As I'm sure you know, Breamie died suddenly and unexpectedly not long ago and putting his initials somewhere unobtrusive, so he can sail with the ship he loved, seems like a fitting memorial. I feel that the Talbot was far more his style than the royal greyhound. Not a historical fact of course, but an important one to me and the people who crewed with him. The grant from king Henry VII gives right to sail 'under our banners and ensignes' but no mention of carved figureheads. I'd say that this could be a clue as to the Matthew itself not being a royal ship and so not having a royal motif as it's figurehead. I'm concerned that covering the Matthew with royal insignia inappropriate to ships from that period of history risks making it look like Earnest Board's delightfully romantic Victorian painting of Cabot's departure from 1906 . Nothing wrong in that, I love Boards colourful image, but historians seem unanimous in saying that it is “way too romantic' (Byrne and Gurr The Bristol Story). The Talbot Research society's 'Talbotania' dated Feb 1999 has a whole section about the Talbot as a figurehead on the Matthew. They point out that 'the original Matthew probably didn't have a figurehead when she was built but it is quite probable that one was made and fitted as a good luck symbol before the ship set out on her voyage across the Atlantic'. It appears that in the 15th century, figureheads would often be carved by the ship's carpenters. Professional figurehead carvers (and the more complicated designs that they carved) don't seem to come along until later, around the sixteenth century when figureheads started to become more common. A ship's carpenter would be using his tools (axes, saws and simple gouges etc., not specialist carving tools) and so would produce something a lot simpler than the White Greyhound of Richmond design which you sent me, as contemporary pictorial records seem to show. Using a hound that could well have rescued Bristolians in trouble and been part of harbour life, rather than the badge of a monarch who gave Cabot some expenses and a warrant, but rarely even visited the city (although he did visit St Annes well in Brislington a couple of times), seems to me to be more appropriate on a figurehead ship for the city of Bristol. The feet would have sturdy supports hidden on the inside of the design to stop them breaking. Unfortunately, this post has a sad footnote. This project never had the chance to be finished. The ship now has a nicely carved but, in my opinion, historically inaccurate greyhound on the front of it. I have been carving regularly since 1994, although I remember having a knife taken off me at school when I was about 10 years old- some places are more suited to practising whittling than others!